“Where are you from?” This question is common enough for people who travel outside their native lands. As an Indian immigrant to the US, it was easy for me to answer this question with “I am originally from India”. There are enough immigrants in the US from enough countries that the explanation goes down okay. But now that we are stationed in China, things are more complicated. My first answer to this question is, “I am from the US”. This is met with a confused look and a glinting, questioning stare. On cue, I immediately follow up with, “But I am originally from India.” This is when the questioner’s face relaxes and a comforted smile breaks out. Of course, “from the US” is more acceptable. I wouldn’t dare say, “I am American.” In China, Americans are white people with American accents. Or maybe some Black or Hispanic people with American accents. Certainly not Asians like me, Indian-looking people with Indian accents. We must stay in our respective Asian boxes, or we are seen as hiding the truth behind an American flag. So the follow-up explanation is a must. And once declared, THAT’S the box we belong in. In China, I am Indian once again. I am torn. The International Day being discussed is an event at my daughter’s school. This school in Beijing has a student body from more than 50 countries. We are at a Parent Association meeting and I don’t see any other Indians in the room. I suppose I am as close to an Indian we’ve got, and I could do the honors. But would that be fair to my daughter, considering this is her school? America is the only home she’s ever known. Sometimes when she is upset, she says, “Let’s go home, mama” and that home to her is Virginia, USA. Would it be confusing for her if her mother identified as an Indian at her school’s International Day? And, more so, if I identified HER as an Indian at the International Day? I must confess, I already bought a dress for her during my trip to India for this day — a pretty Indian dress in her favorite color, purple, with matching Punjabi shoes in purple and gold. In an American school, that would have been fun — to introduce her classmates to a cultural heritage that she is clearly a part of. But was that lazy thinking on my part? As an American among foreigners that already disregard her rightful claim to her homeland, I can’t help but wonder if I am making a mistake by putting her in the wrong box. Maybe I should tie a bandana on her head using an American flag as an accessory to that Indian dress! Or maybe, I really should forget about her heritage and dress her up as an American — a cheerleader or a track athlete in US colors perhaps. 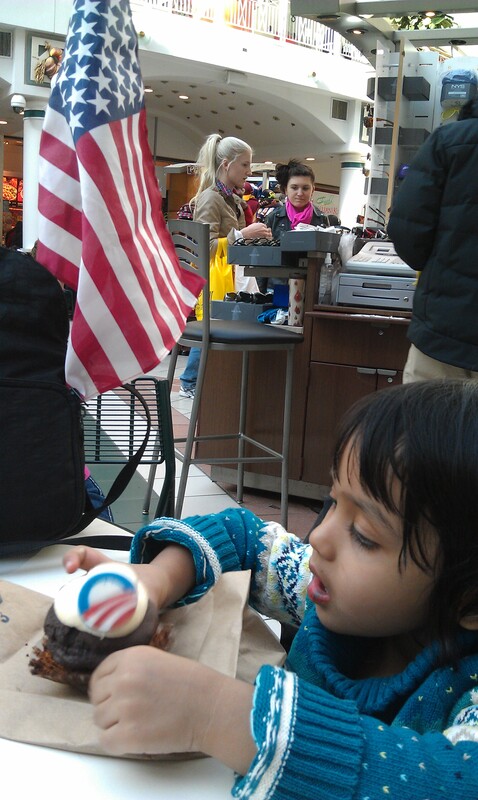 The 44th US Presidential Inauguration, Jan. 2013 — eating an Obama-campaign-logo cupcake at the Pentagon City Mall after attending the inauguration in Washington D.C.
What is the best approach to keep my daughter secure in her identity, I wonder. I am not sure I know the answer. Living among fellow-expats, I see situations that are more complicated than ours. 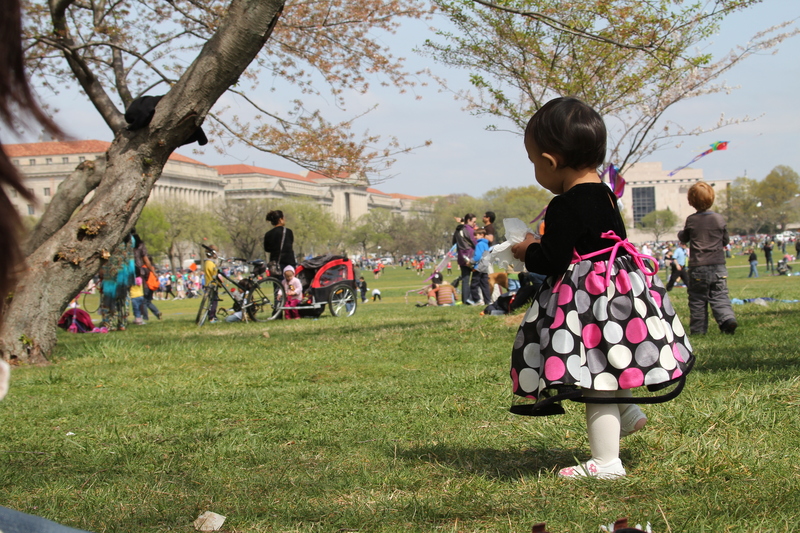 There are kids being brought up in China by spouses from two different countries. Many kids were born here and have never lived in either parent’s country. Then there kids who have been adopted from China that are now living in China as foreigners! Their parents probably struggle with similar questions. What is the best way to give these children a sense of national identity, a sense of where home is? Or, are we raising a group of Babies Without Borders? Ha ha..but not posting the whole comment online.. this is a family friendly post! Is not way past time for the world to start thinking without borders? If thats not a thought and you really need a box to be put into…I would think the lil one is still indian…your indian influence is inevitable as there are generations of breeding & culturing behind it…weaning of it will take an equal if not a larger number of generations. Viju,I would have to disagree with calling her Indian – that is way too narrow a definition for someone in her situation, and I think simply wrong! Just like all Americans in America have individual sets of values, Saachi will have her own, a combination of her Indian heritage and the American culture all around her which is really a melting pot of a bunch of cultures. Most importantly, Saachi thinks ‘home’ is America. Would you say the same if you saw a white American kid? A kid with parents from Germany or England for example? In recent years, I started asking my American friends when and where they came from (because no one is really from America). A surprisingly large number of seemingly regular, white Americans are only first or second generation American with parents or grandparents from Europe, South Africa, Russia etc. Are they not American either? Yes, an Italian descendant may be more likely to be laid back, and a German descendant to set schedules, but does that make them not-American? 🙂 America is the great melting pot of cultures…i agree..but ur ethnicity often defines who you are…coz of parental influence…etc etc etc. Let’s start a Babies without Borders! Why should it be one or the other? Why can’t it be Indian AND American, for instance…. Rashi, it’s true… especially as expats, we see so many kids who have lived in more than one country and are often of mixed races, it would be hard to put them in any box. Once Saachi is old enough she can make her own choices of how she wants to define herself. But right now I feel a burden to make the right choice for her when she cannot yet do it herself (and, then again, maybe she can. I will certainly give her that opportunity). Yes, I feel it would not be right to label her as Indian. She’s most likely American by cultural identity, but probably not Indian except perhaps by race. It would be similar to an ABC setting up a Chinese table but being Chinese only based on racial features. For those of us who are not white but grew up in the US, it’s important when young to be reminded that you have a home where you are welcome. For her maybe it means yes you are American, that being American doesn’t mean you have to be white. Maybe in the future, if you keep moving around then she’ll identify herself less as American and more as “other”. But when she’s young and that’s all she’s known, it’s important not to confuse her by labeling her as Indian based on race. I base this on my own experience of being mixed blood and growing up in many countries. Also from watching my mom, who is Chinese by blood, but also was born and grew up overseas. She gets particularly annoyed when she’s labeled as Chinese. Yes, you can relate well to my daughter’s situation! Since I have been blessed with a precocious kid, I am going to ignore that she’s ‘only 3’ and will ask her which country she feels like representing, and go along with her choice. Identities like people are not static but change with time and place. The only thing static is genes and genetically she will always be Indian. So when anyone is looking at diseases or maladies that are common amongst Indians, she will always belong to that box no matter where she lives. Everything else is fluid. It was America, it is China today and if you decide to move to Germany for the next 10 years of her life, then she might identify herself as German. Geetika﻿, I agree that her genes will remain Indian, and that’s what she will mark on her medical/admission forms when asked about race/ethnicity. But a celebration of international day where you are representing your country is, like you said, more a matter of your self-assessed cultural identity and your loyalty; it’s about which flag you want to wrap yourself in.